The flavor profile of this dish is warm Indian spices with a touch of heat. It works well paired with rice and Lemon Coriander Chicken, almost any other Indian inspired dish, or just grilled chicken. It’s super easy and combines flavorful curry spices such as cumin, coriander, and turmeric. Hot chilli pepper (I like serranos) and cayenne make this dish a little fiery while the acid in the lemon juice helps cut the spice. This recipe was inspired by Cauliflower with Cumin and Asafetida from “Madhur Jaffrey’s Indian Cooking,” by Madhur Jaffrey. Her Indian style recipes are some of my favorite. Jaffrey has been writing cookbooks since the 1970’s (shortly after my grandmother) and was one of the first mainstream Indian style cooks (or perhaps the first). Although I haven’t found any direct connection between her and my grandmother, Paula Peck, Jaffrey worked with Craig Claiborne in the 1960’s, a time when he often featured my grandmother in The New York Times. Since I didn’t use Cauliflower or Asafetida in this recipe, you may be wondering how this recipe even relates to the original. It just so happens that two of the ingredients listed in the name of the recipe are the two I omitted. I simply replaced the Cauliflower with Broccoli and omitted the Asafetida because I didn’t have it on hand and it can only be purchased in Indian or ethnic grocery stores (or online). The other spices and ingredients all remain the same and make this dish easy, tasty, and best of all, nutritious. 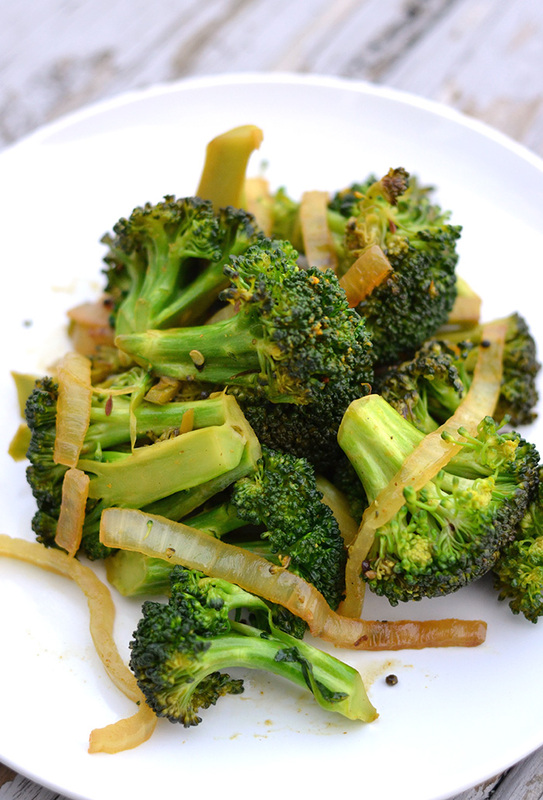 Break the broccoli into florets that are about 1 ½ inches at the head and 1 ½ inches in length. The stem may be peeled and cut into ¼ inch rounds. Put the oil in a large sauté pan over medium-high heat. When hot, add cumin seeds. Wait about 10 seconds and stir in onions. Saute for about 2 minutes or until onion slices brown. Now add broccoli and green chili. Turn heat down to medium and toss. Add ground cumin, ground coriander, turmeric, cayenne, and salt. Toss for another minute. Add water and lemon juice, toss and bring to a simmer. Cover, turn heat to low and cook for 5-7 minutes or just until broccoli is tender.